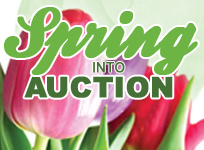 The Friends of MRT will host "Spring Into Auction" on Thursday, May 10, at 6:00 p.m. at the UMass Lowell Inn & Conference Center, 50 Warren Street in Lowell. The event will feature both live and silent auctions with a wide range of items and unique experiences up for bid including trips, sports memorabilia, artwork and much more. Dinner will be served, and a cash bar will be available. Tickets are $65 per person, and can be purchased online at MerrimackRep.org or by calling 978-654-7552. Proceeds from the event support Merrimack Repertory Theatre's mainstage productions and education programs. "Spring Into Auction" will feature Celebrity Auctioneer Susan Wornick, news anchor for WCVB-TV and winner of three regional Emmy Awards and a Silver Circle Award from The National Academy of Television Arts & Science. Friends of MRT co-chair Ellen Gath commented, “'Spring Into Auction' is the Friends’ largest event of the season. Through the Auction we are able to raise in excess of $100,000 to support MRT’s mission of bringing quality professional theatre to the area." The Friends of MRT is an auxiliary fundraising group that hosts special events, social functions and fund drives throughout the year. The group plays a pivotal role in strengthening MRT’s base of support by introducing new people to the theatre and making events like this possible. To join the Friends of MRT, please contact Michael LaChance, Office Administrator at 978-654-7550.